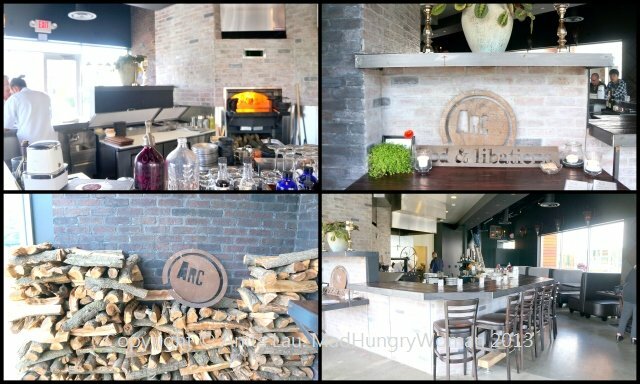 I’ve visited ARC several times now after its opening at SoCo’s The OC Mix. My son absolutely loves it and often asks if we can go back again and for me, I find the simple, yet rustic menu very appealing. After several visits, I feel I’ve tried enough of the menu to give a good rundown of what Chef/Owner Noah Blom and partner Marin Howarth’s vision for this trendsetter of a restaurant is all about. They call the concept “scratch cooking”, a hands-on approach to cooking like we did back in the day before we had all this technology. 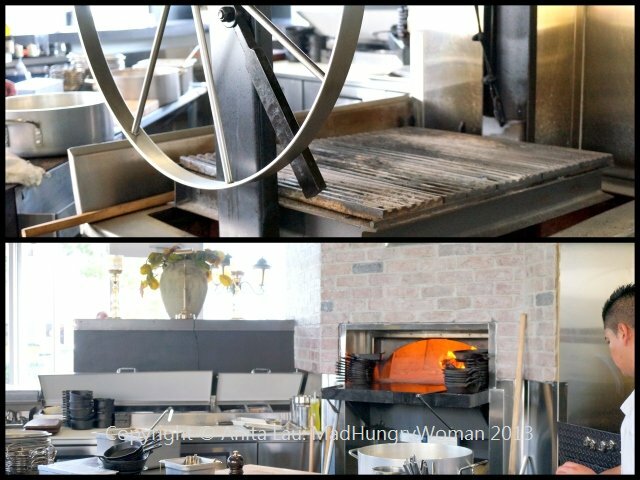 Everything is cooked on an open flame, or a wood fire oven, there are no stoves here. It’s going back to the basics of cooking. I’ve had many people “complain” to me regarding the menu, how it is overly simplistic. I, on the other hand, loathe an overly complicated menu. Simple, I like. The menu is very straight-forward — fish, pig, duck, veg — that’s the only heading you’ll get, plus a handful of accoutrements for some idea what’s in the dish. But then again, what else do you need? You’ll be served a part of the animal as they plate it because Chef Blom uses the entire animal. 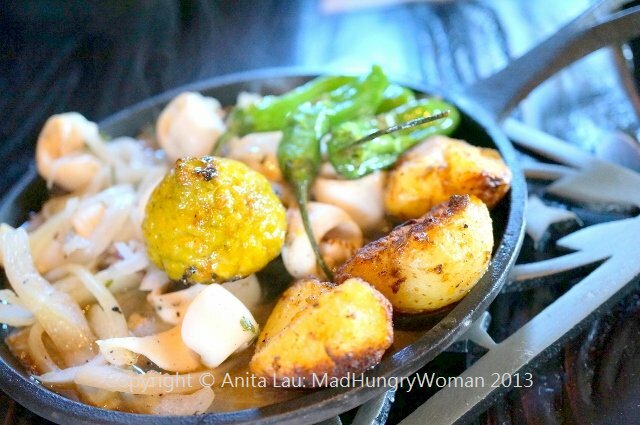 Everything here is served in a cast iron skillet, scalding when it arrives. Trivets are placed on the table for them to sit on as each dish comes out of the oven. One of our favorites was Calamari ($15), with potato, lemon (we’ve had both regular lemon as well as kaffir lime) and pepper. My son pointed out how nice it was that the calamari wasn’t fried. 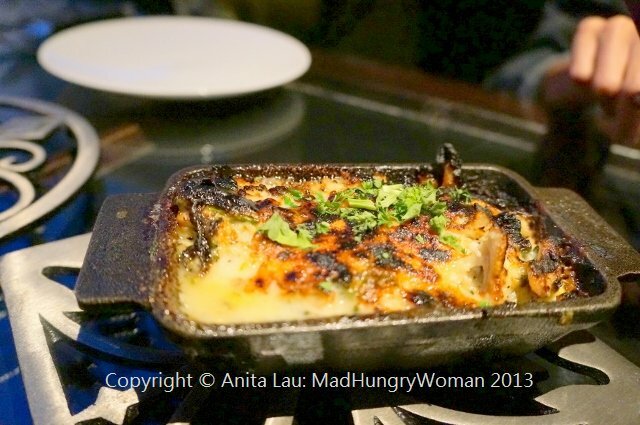 Casserole ($12) with chicken, broccoli and cheddar was a rectangular iron pan of cheesy, gooey, deliciousness. So rich and comforting I don’t think my son wanted to share. One of the items we ordered on every occasion was Duck ($15) which is first cured and then crisped in the oven and served with lemon, jam and honey. The sweetness and tartness from the jam and honey is perfectly paired with the fall-off-the-bone duck. I believe everyone loved it and we are still talking about it a month plus after our visits. The selection for the Veg ($12) always rotate. 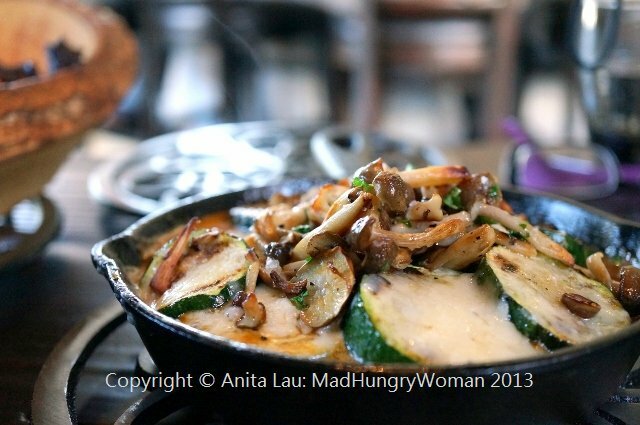 Farm fresh vegetables — zucchini and shimeiji mushrooms were in the skillet on this visit and it was eaten up really quickly by all. 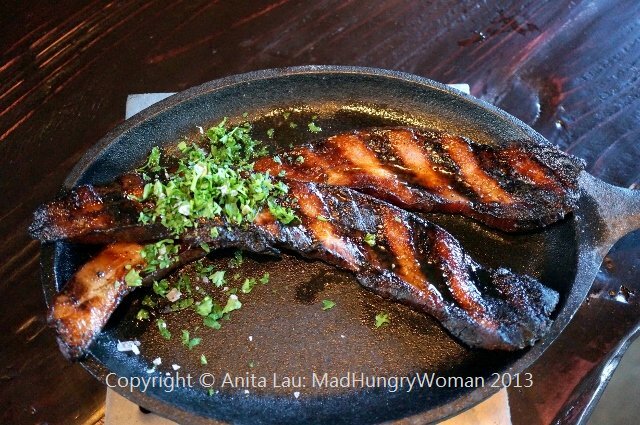 If you’re a fan of Bacon ($8), I highly suggest you order a side of it. Cured and smoked in-house, these thick slices are perfect for sharing. So rich and so decadent, a few slices of this sandwiched between some bread with lettuce and tomato is all I would want for the perfect sandwich! The only item off the regular menu I didn’t really enjoy was Soup ($10) and onion soup which wasn’t rich and hearty like the onions soups I prefer. After all that, now is the time to tell you about the “secret menu”. Well, it’s not really THAT secretive, but if it’s your first visit, you probably won’t know about it. Every day, behind the open flame is the secret menu, surreptitiously written on the refrigerator door. 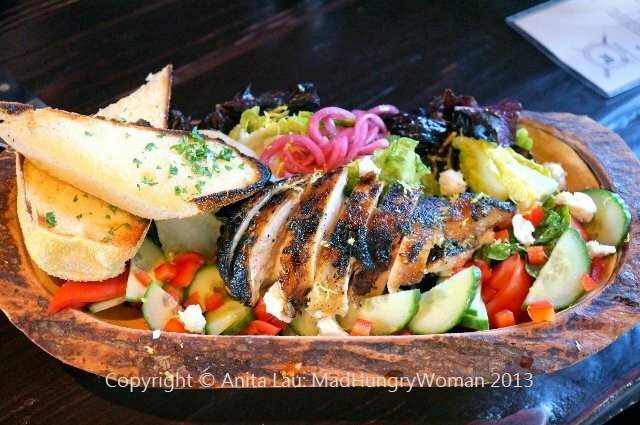 We ordered The Salad ($18) — essentially, a grilled chicken salad served in a wooden serving platter enough for two to share or four as an appetizer. Yes, there was THAT much food!! 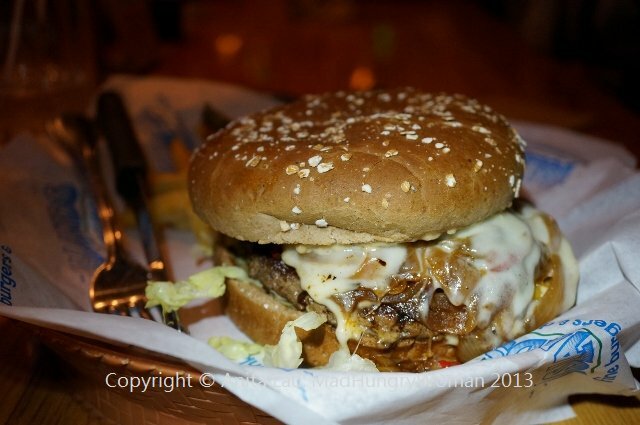 The Burger ($18) is also not on the regular menu but it’s there — oh, it’s there! I’m not even a burger person and I wanted a second bite of this. It’s a big burger and I’m glad there were a lot of us to share it, but I could seriously eat this whole burger myself. 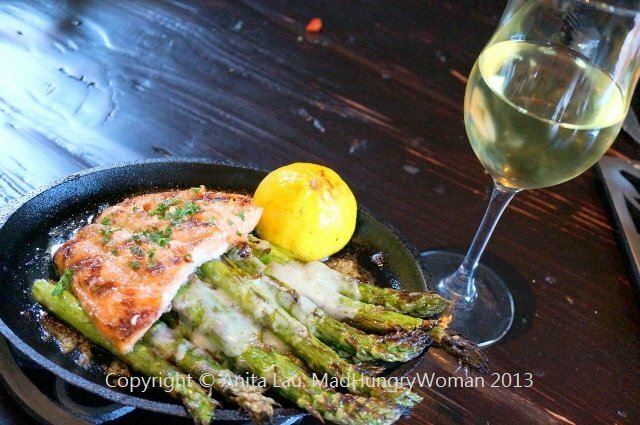 Another special is Salmon ($30), a piece of grilled salmon with vegetables and served with a glass of white wine. This off-the-menu item is an homage to Noah’s mom, who, according to the chef used to cook salmon so dismally it was dry and unpalatable. Here, the salmon is flaky moist and absolutely delicious. It serves as a meal on its own or if you’re like us, we shared! One more little secret at ARC is that everything on the menu can be ordered as a sandwich. So if you wanted the duck, steak or pig as a sandwich, they’ll put it between some delicious bread from OC Baking Company for you to enjoy! Just ask! There are no desserts here. I’ve heard many reasons why from Chef not particularly fond of making desserts to Chef not particularly fond of eating desserts. This way, I don’t have to save room for the desserts my friends order and I can utilize all the space in my stomach for the savory. Someone told me “the cocktails are the desserts!” Music to my ears! I love ARC and I know you will too. 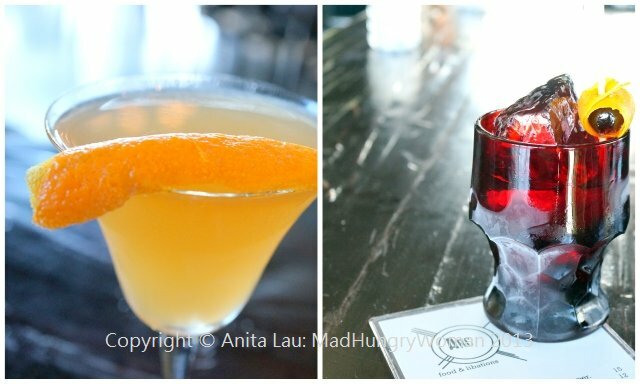 This week, I have $50 for one of my readers to win to visit ARC and sample the delicious eats and libations they have to offer. Leave me a comment with your FULL name telling me why this style of cooking appeals to you. Entries close Sunday 31st. A lucky winner will be announced on Monday, April 1st — and no it won’t be an April fools, you’ll REALLY get the $50 to ARC! 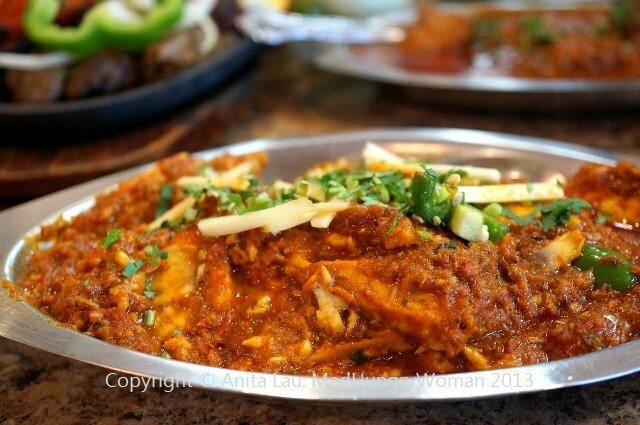 It’s been more than six years since I moved to southern California and it’s been almost as long since I first heard of Noorani and bookmarked it for a visit. 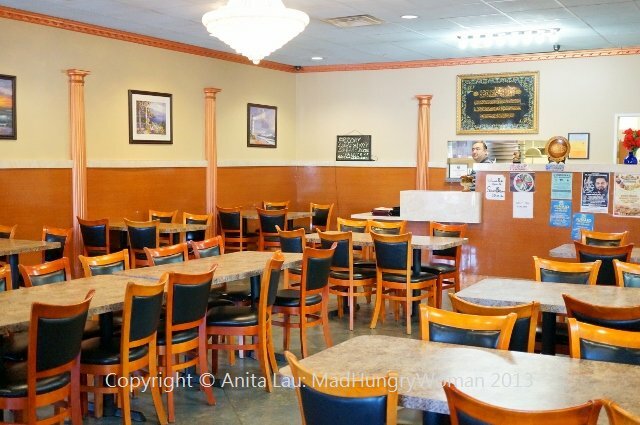 So when my friend asked me to come along to lunch with her and some other friends for Pakistani food, I asked where (Noorani was the only place I knew) and when she said Noorani, I was eager and excited to finally pay them a visit. I am glad I didn’t embark on this adventure on my own because I wouldn’t have known what to order. I’ve never had Pakistani cuisine before and although Indian food is similar, there are definitely huge differences when you are from the area as opposed to someone like me who is observing from the outside. First of all, most Pakistanis are Muslim so no pork is used here. Unlike Indian cuisine, you will find beef on the menu, but everything is ‘halal‘ (a method of slaughtering similar to how Jews slaughter their meat — ‘kosher‘). Proteins such as lamb, goat, beef and chicken dominate the menu, there is also fish and shrimp and various vegetarian options as well. 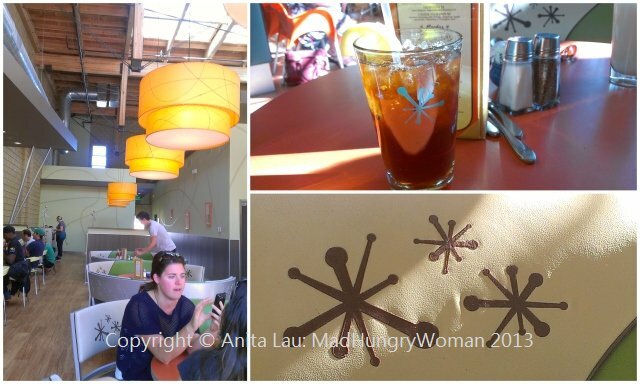 We left the ordering to the expert, a new-found friend and fellow food lover. She deftly went through the menu and picked out a variety of things for us to try. 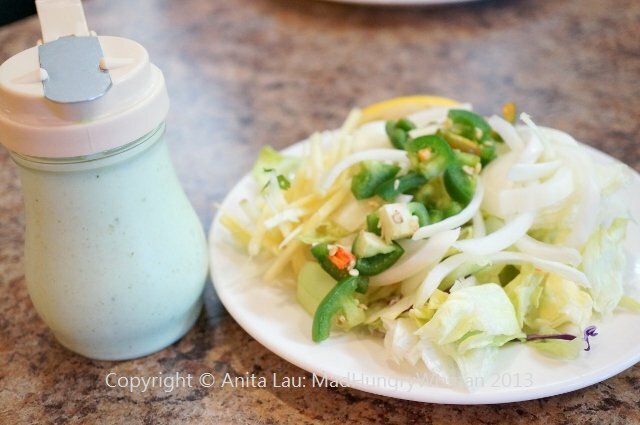 Before the food arrived a plate of conndiments is given with sliced onions, jalapenos and lettuce. There is also a jar of yogurt sauce. Tandoori Mix Plate ($13.95) consists of tandoori chicken, chicken tikka, seekh kabob (ground beef made into a log), bihiri kabob (spiced tender beef), all cooked in the tandoor, or a clay oven, and served on a sizzling platter topped with onions, red and green peppers and chopped jalapenos with lemon wedges. 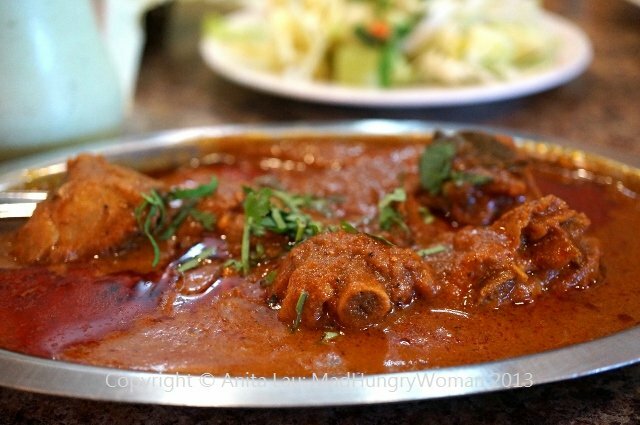 I really enjoyed the Chicken Qurma ($6.99) — bone in chicken pieces (white meat available) bathed in a mild tomato based curry sauce. What I love about it is that there is no cream at all, making it less heavy and not as harsh on my lactose-intolerant stomach. If you are a fan of biryani, the one here is rather flavorful. 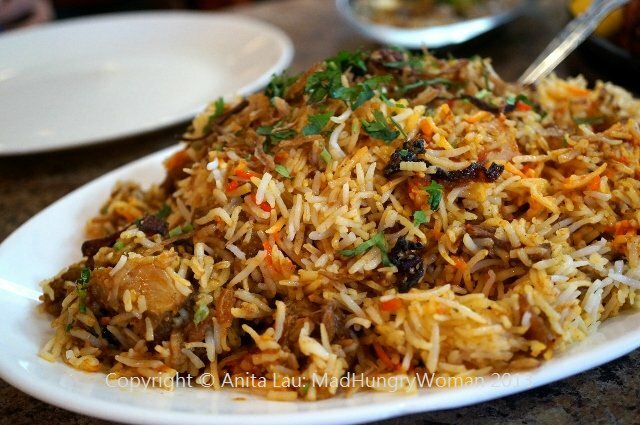 Lamb Biryani ($9.99) is an aromatic dish of basmati rice flavored with spices and steamed with lamb pieces. If you don’t want lamb, there are many varieties to choose from including chicken, fish, beef or even, vegetable. 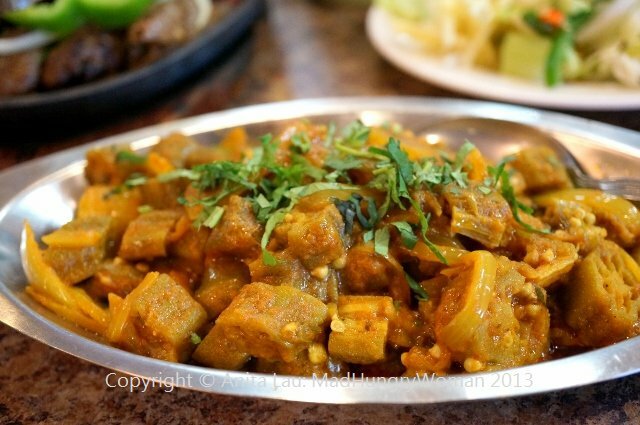 I absolutely loved the Bhindi ($6.99), sliced okra cooked with onions, chili, tomatoes and spices. In fact, I could have eaten this with some rice and called it a day it was THAT delicious. Fish Karahi ($9.99) wasn’t my favorite. I’m not sure what sort of fish was used but it had a muddy, fishy taste. The accompanying sauce was on the mild side which wasn’t enough to balance out the fish’s pungent aromas. 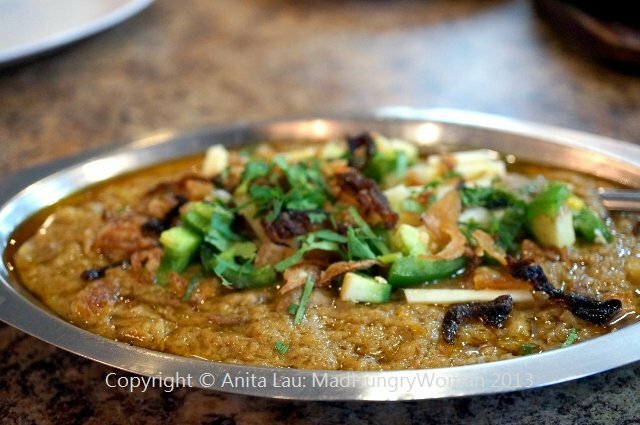 The same goes for Haleem ($7.99) which I googled and the explanation was a stew of beef, lentils and wheat pounded into a paste. It was on the bland side and wasn’t texturally pleasing to me. Besides rice, breads are also traditionally eaten with the meal. 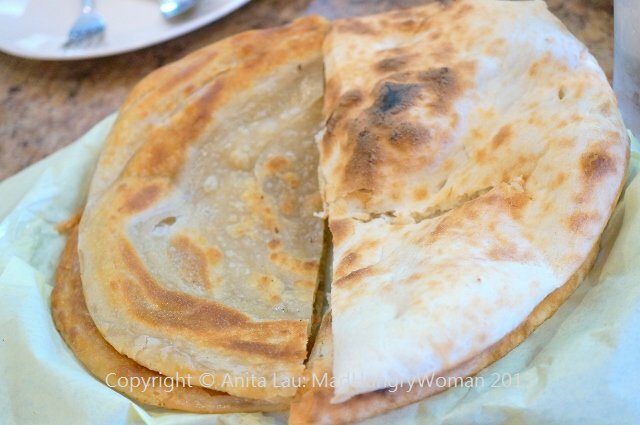 Plain Naan ($1) or Paratha ($2) accompany without overpowering. I prefer the latter even though it is on the greasy side, but it is flaky and crispy. 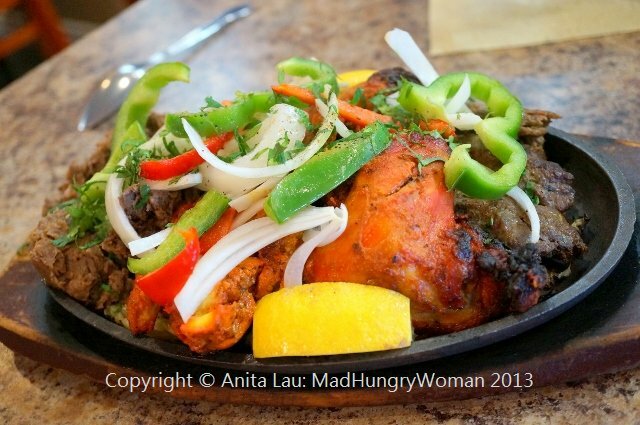 If you like Indian cuisine you will like Noorani, the flavors are similar but without the usual creamy richness of northern Indian cuisine which is typically served in restaurants in southern California. 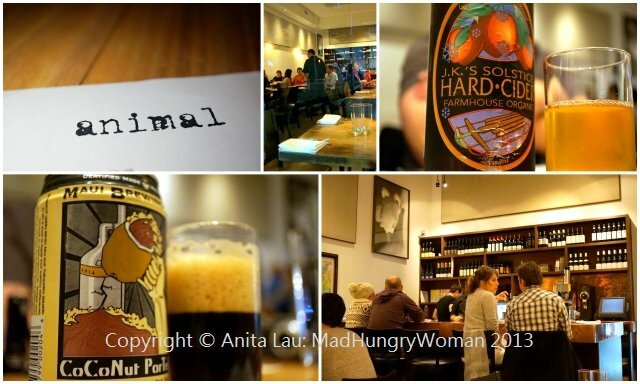 It’s been several years since I last visited Animal. I never wrote about it because my photos didn’t come out the last time and I never post anything without at least reasonably clear photos. On this trip, I made sure to bring my good camera, plus lighting because I remembered how dark it was in the restaurant. My friends and I left really early so we’d make our 6.30pm reservation. We couldn’t believe our luck when we dodged Friday afternoon LA traffic and arrived 45 minutes before our time and managed to find decent parking as well! We started with a few beers, but pretty much launched straight into ordering! 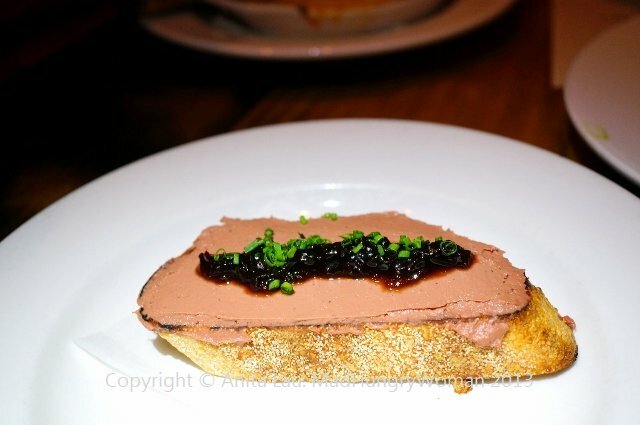 The Chicken Liver Toast ($3) was so good we had two orders of these. 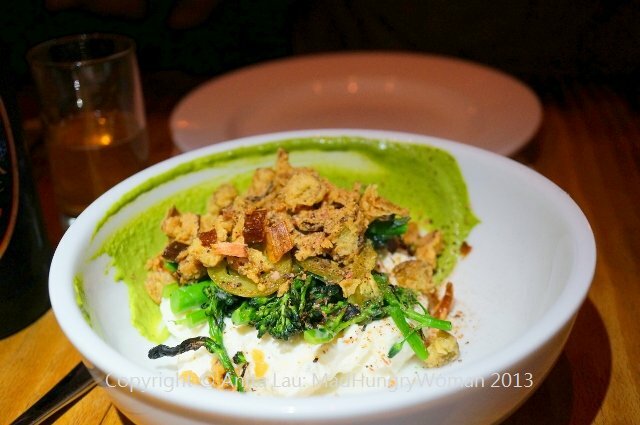 The chicken liver was creamy with a smoky caramelized shallot topping adding a hint of sweetness. I remember Pig Tails ($11) from my previous visit, but unfortunately, some at the table weren’t fans of buffalo sauce. I, on the other hand, loved it and was chewing the crispy parts off the bone with glee. Like a true buffalo style dish, it was accompanied by celery and ranch. Although I wouldn’t recommend non-meat eaters to come to Animal because the menu is predominantly meat-centric, the Local Burrata ($12) was seriously good! Baby broccoli, katsuobushi, green garlic, leeks and jalapeno complete a very complex mouthful of flavors which even my son wanted more of. 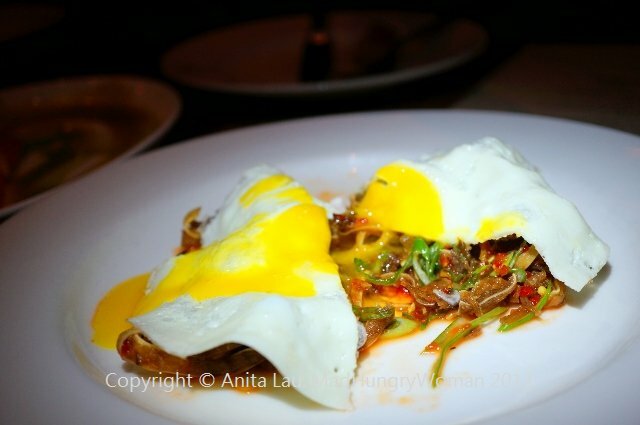 Pig Ear ($12) was a plateful of thin strips of pig ear fried crispy, flavored with chili lime and topped with a runny fried egg. The oozing yolk added a creaminess to the crunch of the ears making this a hit with everyone at the table! 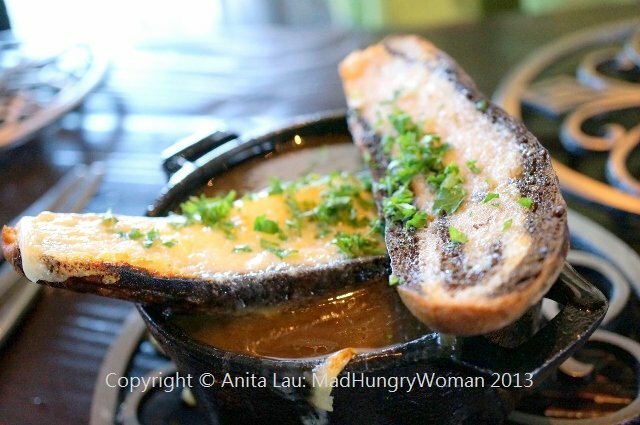 The richness of the Melted Petit Basque ($12) dotted with chorizo and served with grilled bread meant I only had room for a small portion. I was glad there were many of us to share this item even though I know my son wanted more, but we had a lot of food still to come. 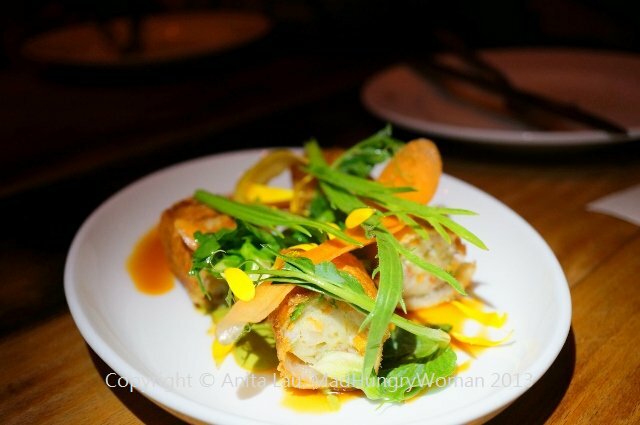 My least favorite item of the evening was Shrimp & Rabbit Sausage Spring Roll ($13). The texture of the spring roll didn’t appeal to me. The filling was mushy and the entire dish bland and boring even with the green curry. 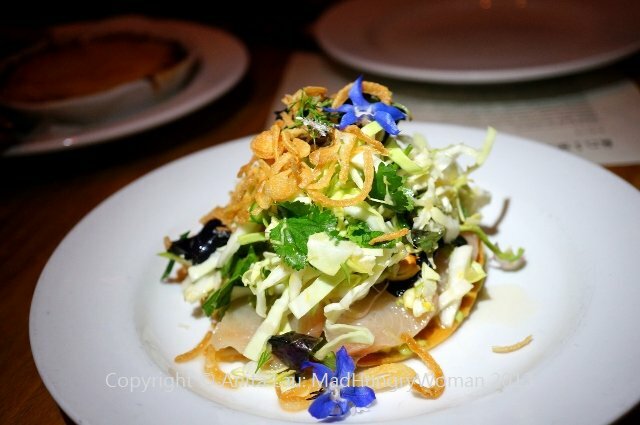 Hamachi Tostada ($15) on the other hand was my favorite. I remember this being a favorite from my previous visit and it wasn’t a surprise everyone loved it as well. The cabbage slaw with fresh herbs, fish sauce vinaigrette and peanuts made it a very Vietnamese flavored dish — refreshing and palate cleansing! We had another! 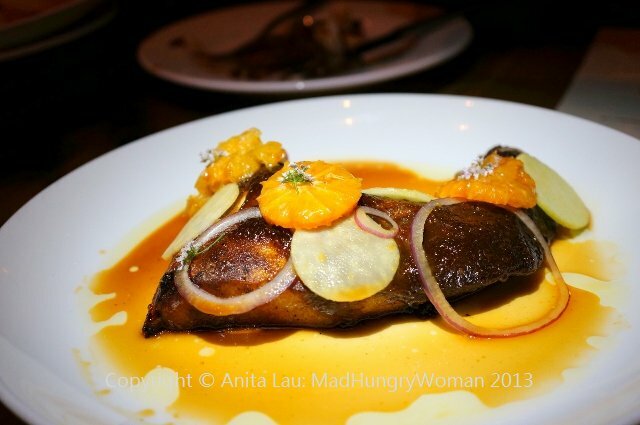 The Yellowtail Collar ($16) with jerk spices was strangely addicting but not everyone at the table felt that way. Some found the jerk seasoning killed the flavor of the fish and another found the texture of the fish spongey. I liked the combination of the citrus and palm sugar with the jerk spices making it a spicy, sweet and tart finish. It would’ve been better with a bowl of rice! 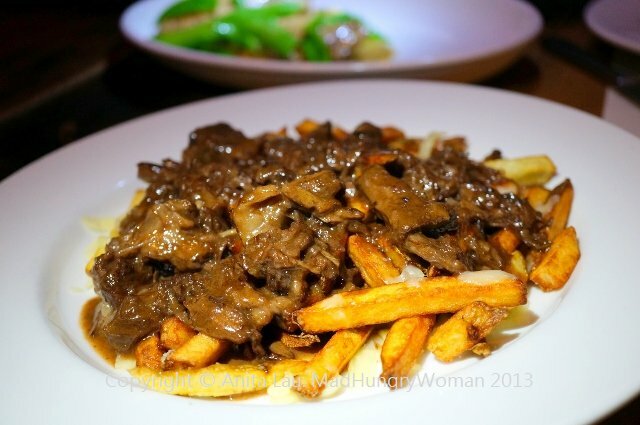 Another favorite was Poutine ($18) topped with oxtail gravy and cheddar. My son and Austin of The Hungry Dogg devoured the second plate very quickly! 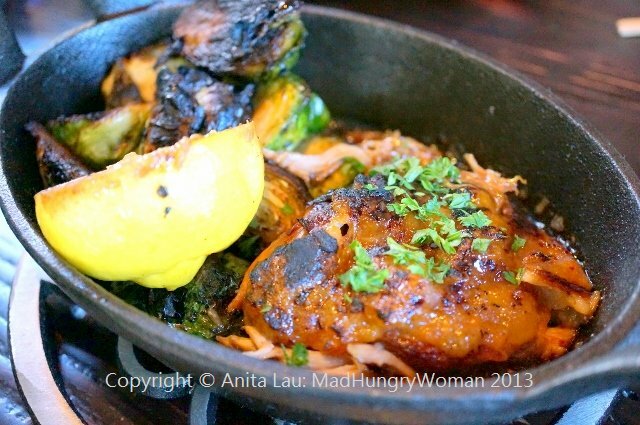 Rich and intensely flavored, this is comfort food perfection! 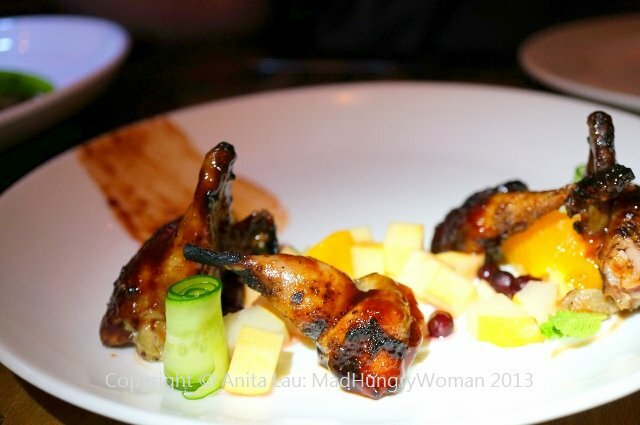 I could have eaten a whole plate of the Grilled Quail ($19) myself. The quail was not gamey at all. In fact, it was on the mild side. The plum char siu sauce with pear, apple, yogurt and pomegranate created a sweet tart finish which would have been even better had the quail been stronger. Still, it was absolutely delicious! 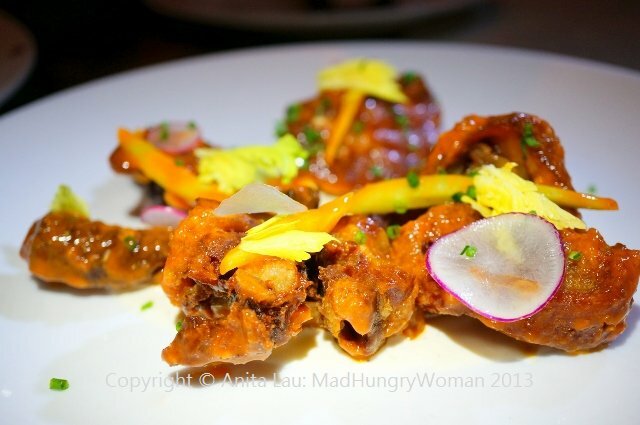 The star of the night in terms of entrees was definitely the Braised Rabbit Legs ($29). The mustard jus combined with the potato puree made for a creaminess like no other. 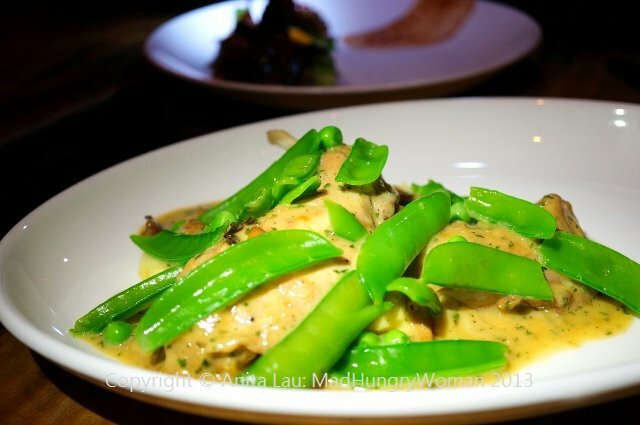 The addition of bright green snap peas and flavorful mushrooms made this the ultimate in comfort eating. We were all very sad we had no room for another round of this. If you still have room for dessert, there are four to choose from. 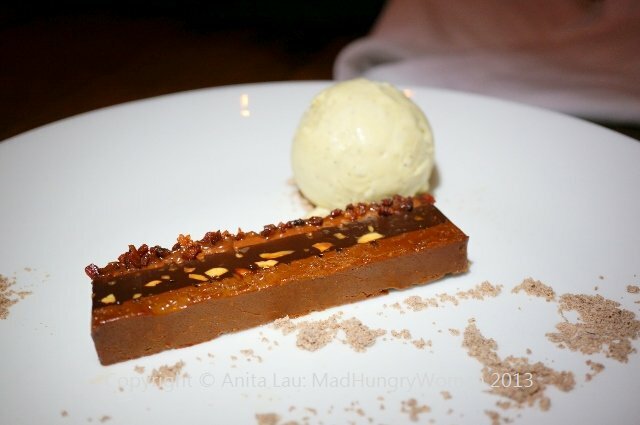 Since I didn’t really care one way or another, the table chose Bacon Chocolate Crunch Bar ($8) s&p ice cream — nice if you like chocolate. Has a nice texture and the saltiness of the bacon was very mild. 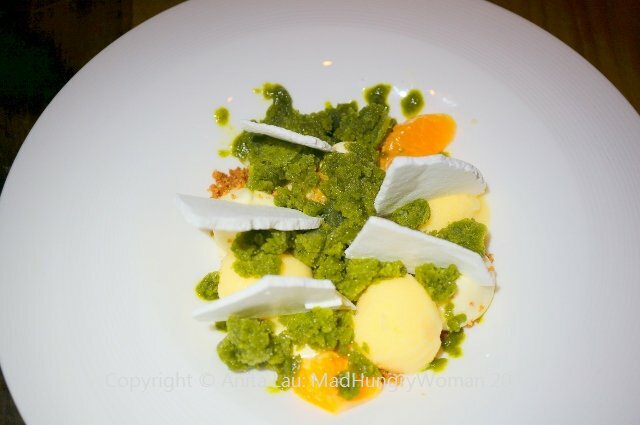 The Page Mandarin Sherbet ($8) with cheesecake, sour grass granita and bits of meringue pieces didn’t do it for me. In fact, I thought it was weird and gross both in taste and texture. Austin was the only one who enjoyed this dessert. If you haven’t had the Animal experience, I highly recommend you go and have one. Make a reservation because although walk-ins are accepted at the bar, chances are you won’t be able to get a seat. This is one of those places where the creativity and innovation behind the menu is truly eye-opening and you will be glad you did it! It’s been a long time since I’ve been to an Islands. It’s funny because even though they are known for burgers, I usually get something else whenever I go with my friends who want burgers. On this recent trip, I went with my son who loves burgers. We arrived early evening and happy hour was still going on. 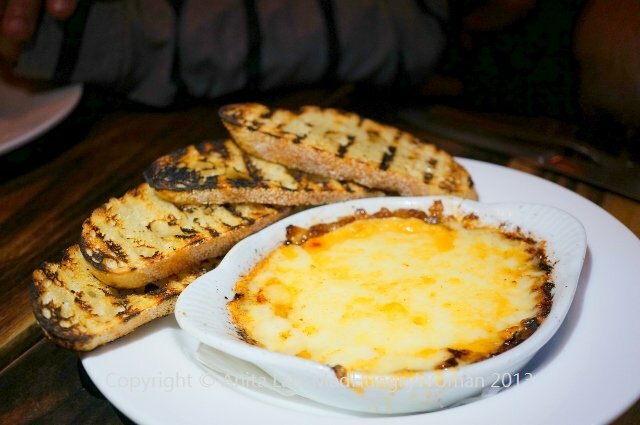 They have a handful of $5 or under items which are good accompaniments for one or two drinks. 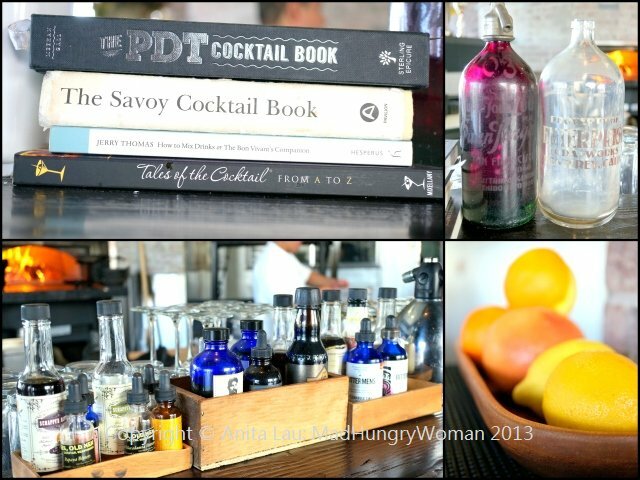 I was happy to see they had skinny margaritas and ordered the Margarita Lite ($8.90) which uses Patron Silver, organic agave, fresh lime juice and Triple Sec. 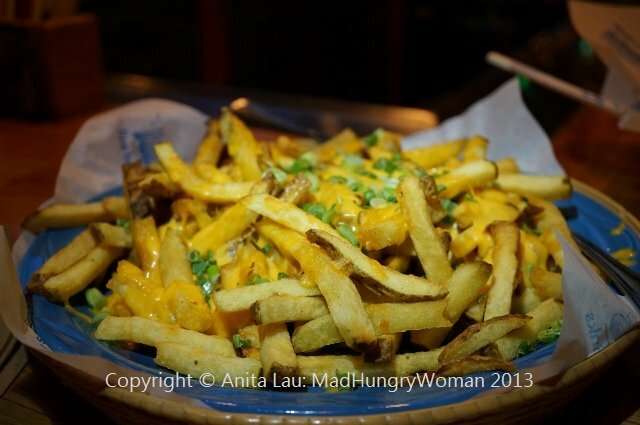 On the happy hour menu, we chose the Cheddar Fries ($3.95) and it was a huge plateful of Island fries covered with melted cheddar and scallions. I kept telling my son to not overindulge in it because he still had a burger coming, but he’s a growing boy and I couldn’t believe how much he was able to pack away! The Poke ($8.95) a new item on the menu is pretty damn good. 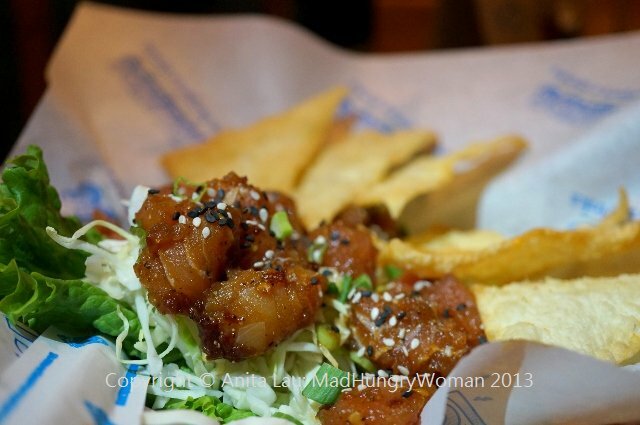 Chunks of albacore tuna is tossed in soy, sesame oil, sambal and sits on a bed of shredded cabbage topped with diced scallions and sesame seeds. Loved this! 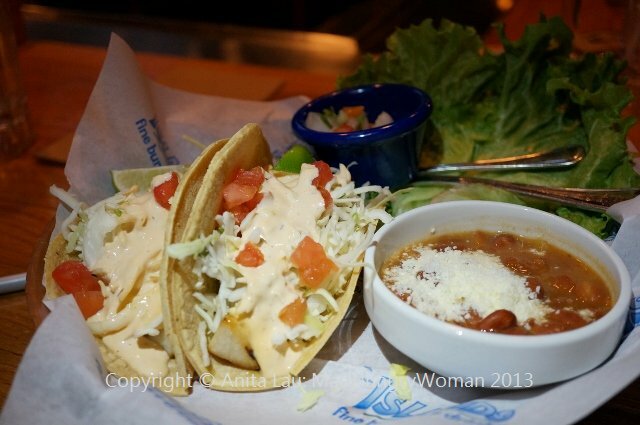 If you like fish tacos, the Grilled Fish ($10.69/2 tacos) offers the day’s selection of fresh fish on corn tortillas and topped with cabbage, cilantro, diced tomatoes and a house chipotle white sauce. Nicely seasoned albeit the tortillas were a little hard. The ranchero beans served on the side is really good! My favorite of the night was a new item from their “Local Menu”. 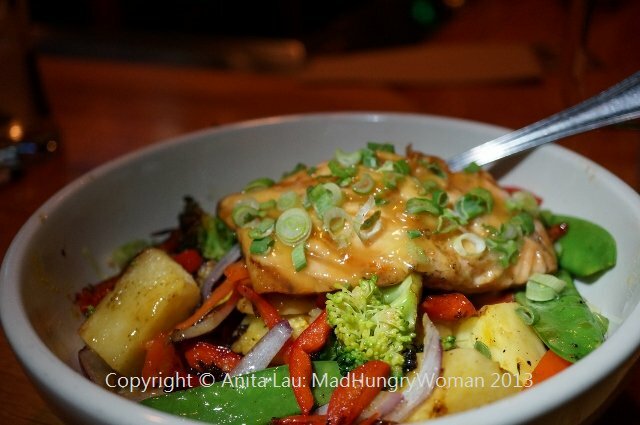 Salmon Miso Glazed Bowl ($12.49) is a brown rice bowl with fresh grilled pineapple chunks, bell peppers, red onions, water chestnuts, snow peas, broccoli and scallions. A nice piece of fresh grilled Atlantic salmon is then placed on top making it a delicious and healthy meal. You can also get this in teriyaki or hoisin sauce. 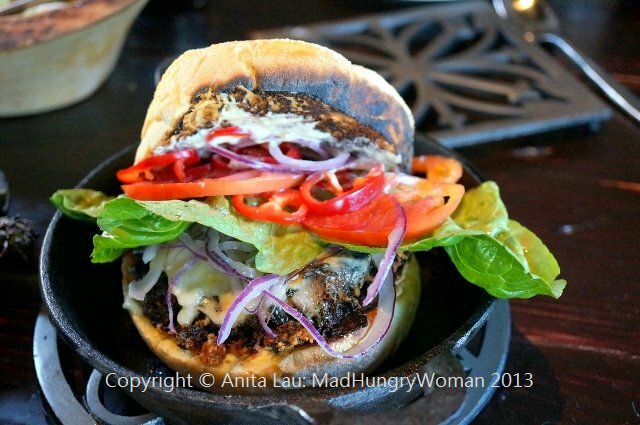 My son loved his Nalu Nalu ($10.85) burger, a new menu item which is only offered for a limited time. This burger is reminiscent of a Philly cheesesteak topped with provolone cheese, sauteed onions, mixed peppers, hot deli pepper rings and lettuce with roasted garlic aioli. I took a bite and it was very flavorful. I’m not a huge burger person but my son devoured it in its entirety. I wish I had such metabolism!! 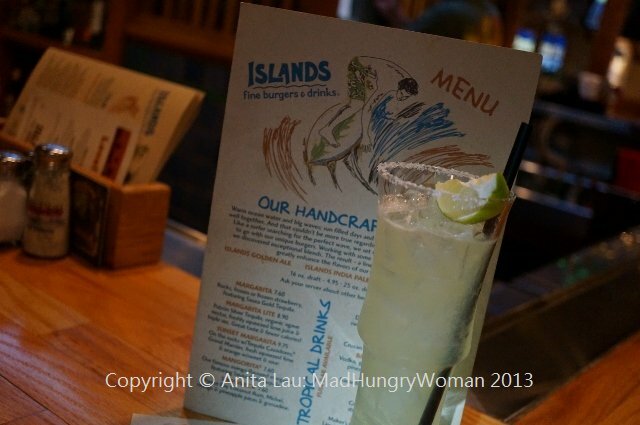 This week, Islands has generously donated THREE $25 giftcards for my readers to win. Leave me a comment with your FULL name (you won’t be entered if you don’t leave your full name!) and tell me if you’re a burger person or if you’ll be ordering something other than burgers — and why! Three lucky winners will be chosen to win one of those giftcards. Entries close Thursday and winner will be announced Friday. Good Luck! You’ve all heard of celebrities having personal chefs, but what if I told you that this is an accessible resource for “normal” people like us as well? Last week I was invited to Chef Chris Henry’s house for a soiree, to be introduced to what a personal chef’s services means exactly. Depending on your family’s needs, Chris will customize a weekly menu based on dietary requirements — gluten free, wheat free, dairy free, vegetarian etc — and work together with you to create menus you and your family will enjoy. Essentially she will come into your home (or prepare them in her home and bring them to you) to cook everything and this includes shopping for the groceries as well. We were treated to a taste of what Chris would make for her clients. 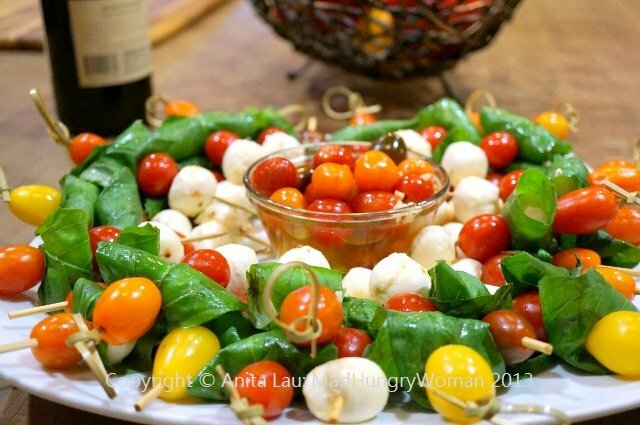 For appetizers, there were Marinated Mozzarella Skewers with Cherry Tomatoes & Fresh Basil, perfect if you were wanting to host a dinner. My son even ate these and he’s usually not a fan of tomatoes! 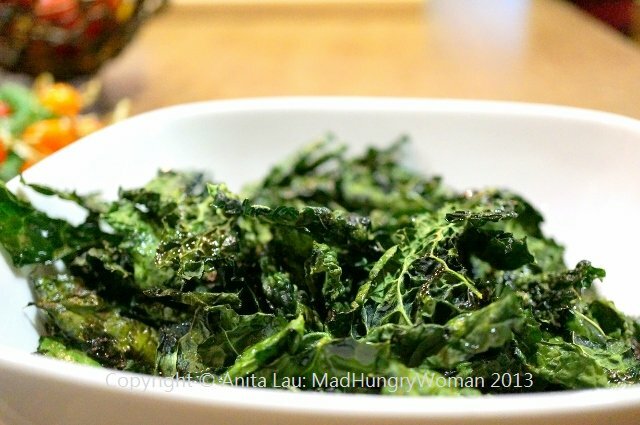 Then there were Roasted Kale Chips which is a great way to get the kids to eat their veggies. I was so inspired by Chris I came home and made some of these myself! 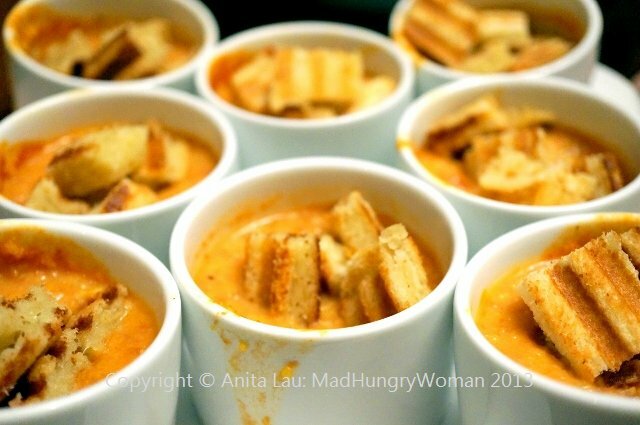 Tomato Soup with Toast Gruyere Croutons was hearty and tasty, yet really light as well. The gruyere croutons were delicious and such an innovative idea to serve the soup with. 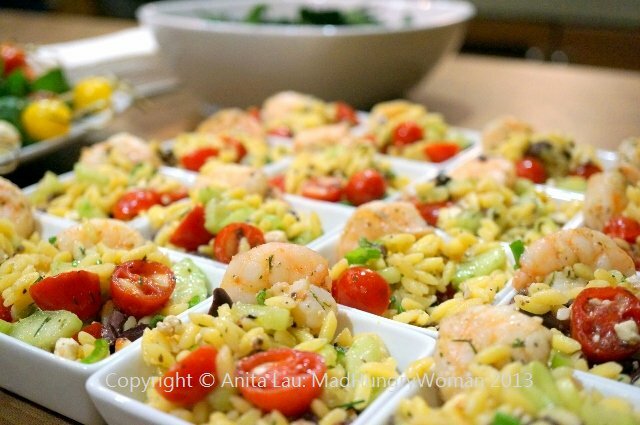 One of my favorites was the Lemon Shrimp Orzo Salad with Feta. This would make for a great appetizer or main course. 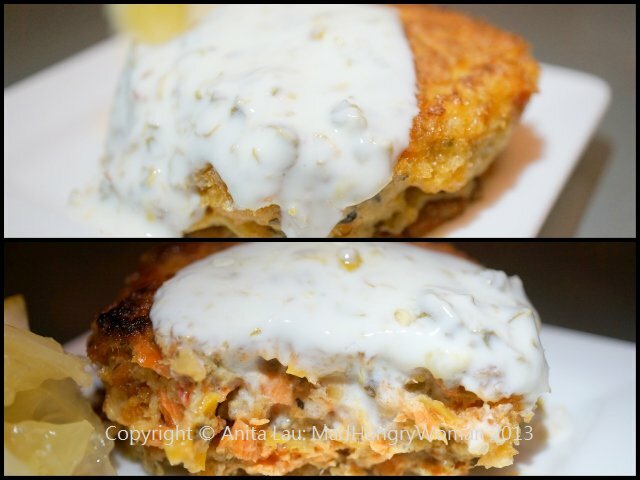 Another really healthy and flavorful item was Salmon “Rainbow Cakes” with Greek Yogurt Caper Sauce. What a great way to get the kids to eat fish! My son is not a fan of fish and devoured this! 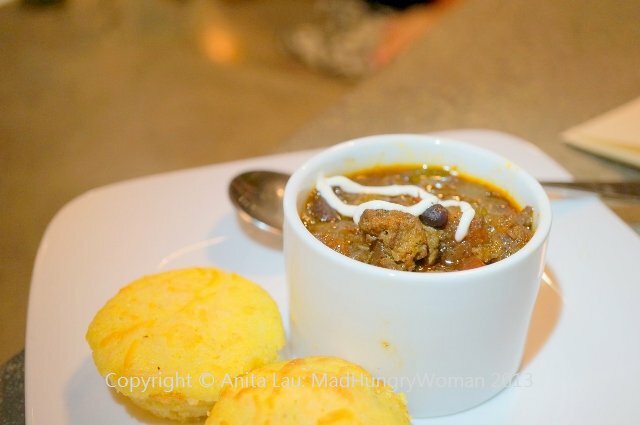 Even the Beef & Espresso Chili with Cayenne Cream Sauce wasn’t heavy and thick. It was light and definitely tasted home made and served with cute Mini Corn Cheese Muffins. For a comfort food treat, but without the fat and calories, Home-style Turkey Meatloaf with Mashed Sweet Potatoes, Sage & Caramelized Onions was indeed healthy and savory. 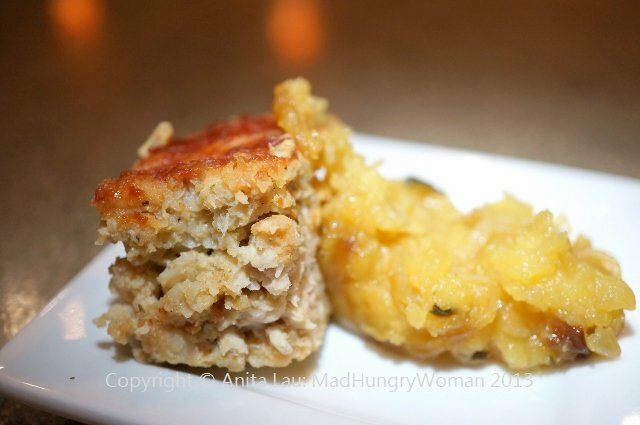 The mashed sweet potatoes were delicious. 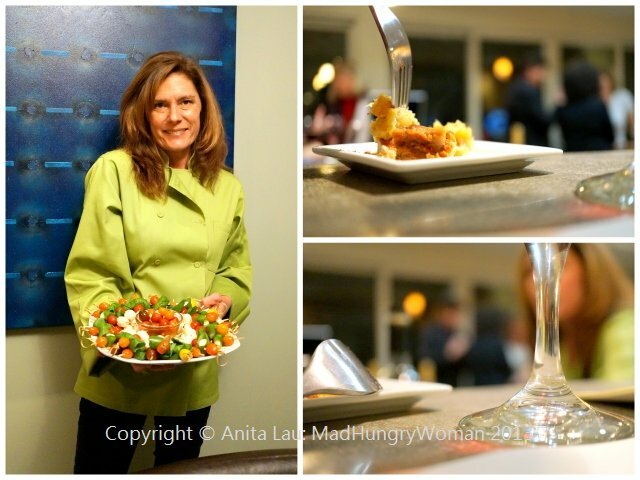 Chef Chris is a mom herself and her menus reflect the healthy home-cooked aspect of that. These dishes were all items I would be comfortable and happy to serve my child knowing he will be fed a nutritious yet delicious meal. The meals are approximately $350 per week for 3-4 entree meals for a family of four. This includes the shopping, the cooking as well as the cleaning up. For more information, visit Chef Chris Henry’s website or you can call 949-433-9995 or email chris@freshpersonalchefservice.com for a free consultation. 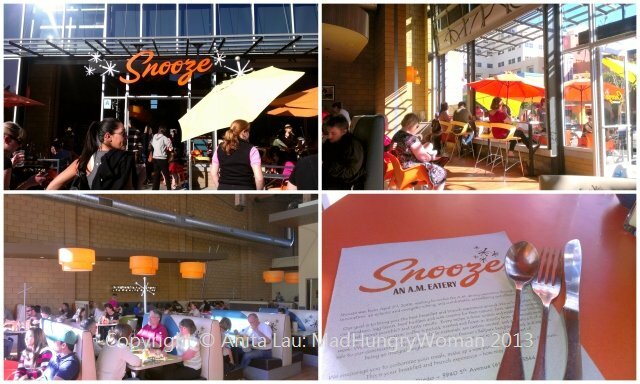 I’ve seen Snooze on Facebook, Twitter and Instagram and have mentally kept it on my mind for when I’m in San Diego to give them a try. I’ve asked my friends many times to come with me — for months mind you — and finally convinced one to come along for breakfast one Saturday morning. We weren’t late. In fact, it was around 9.15 when I put my name on the waiting list. I asked how long it would be and was told 25 minutes. Under normal circumstances, I might not have stayed, but I was here, and I had a dining companion so I waited. The nice thing about the restaurant is that they have a little counter inside the restaurant on the right hand side where they have coffee and water you can help yourself to while you wait. It was a really hot morning and I was thankful for the icy cold water. At exactly 25 minutes, we were called and seated at a really cute table. Our server Ariel was a delight as well. I was starving by now and we quickly ordered. 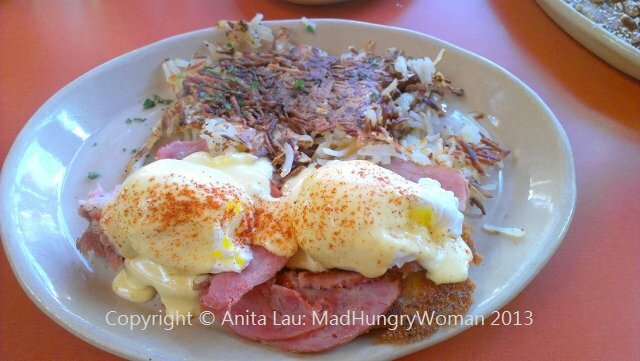 It was a no-brainer for me as eggs Benedict was on the menu and that’s what I always gauge a breakfast place with on a first (and perhaps subsequent) visit. The Ham Benny III ($12) was definitely calling my name. I liked the crispy muffin and the shaved ham was a nice touch, but it wasn’t a wow-me moment even with the perfectly poached eggs. It was just okay. The true disappointment came in the form of the hash browns. I asked for them to be extra crispy, which they were, but a bit TOO much. They were on the verge of burnt and the middle was mealy and doughy like they had been sitting around too long covered in starchiness. 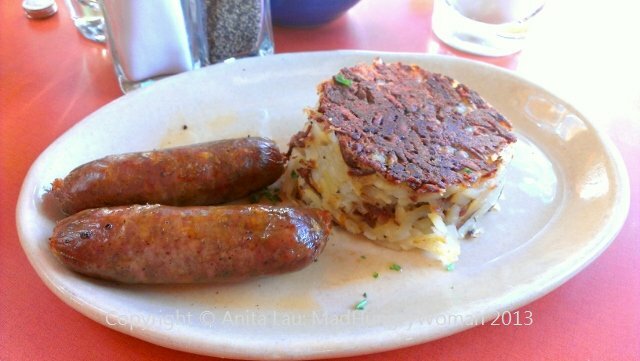 My friend ordered pancakes, but the hash brown side ($2) on that plate was just as dismal. The sausage links ($3.50) were flavorful and nicely seasoned, but overcooked and dry. I’m glad I insisted we order the flight of pancakes instead of just one type. Pancake Flight ($9) allows for three different pancakes so you get a taste of what they have on the menu. Pineapple Upside Down is a buttermilk pancake with caramelized pineapple chunks, housemade vanilla creme anglaise and cinnamon butter. The dollop of pineapple wasn’t enough to cover the entire pancake hence leaving us with many mouthfuls of pancake sans pineapple. In fact, the two mouthfuls I sampled were devoid of any pineapple all together. 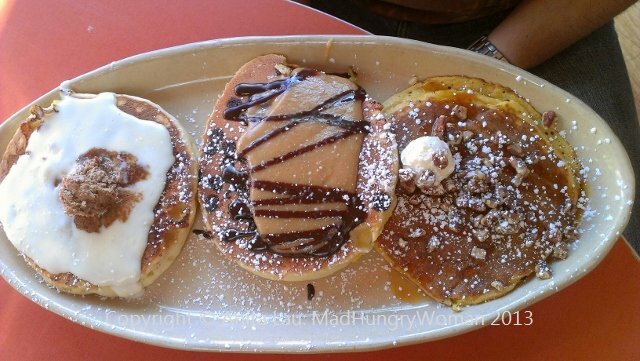 The Peanut Butter Cup pancake (BIG MISTAKE my friend who ordered it) was just a disaster. I think this is something a kid would enjoy, but it was just a pancake mess. The pancake was dense and doughy. Not good! Sweet Potato pancake was FANTASTIC! In fact, I wouldn’t mind a whole plate of this if I was in the pancake mood. This is the restaurant’s signature sweet potato buttermilk pancake topped with homemade caramel, pecans and ginger butter. The pancake was fluffy and the caramel not overly sweet. All pancakes come three on a plate for $7.50. Normally I wouldn’t even bother writing up a lackluster meal, but I was so looking forward to this and it really fell short of expectation. The place is really cute, hip and a joy to be in. The one hour wait from putting our name down to having my first bite of food is annoying, but at the end of the day, what was put in front of me was certainly not worth an hour’s wait, even if I didn’t have to pay for the meal.